Hi there, Room & Board readers! I’m so excited to be joining you here today! My name is Anne Sage and I’m a lifestyle blogger and stylist based in Los Angeles. 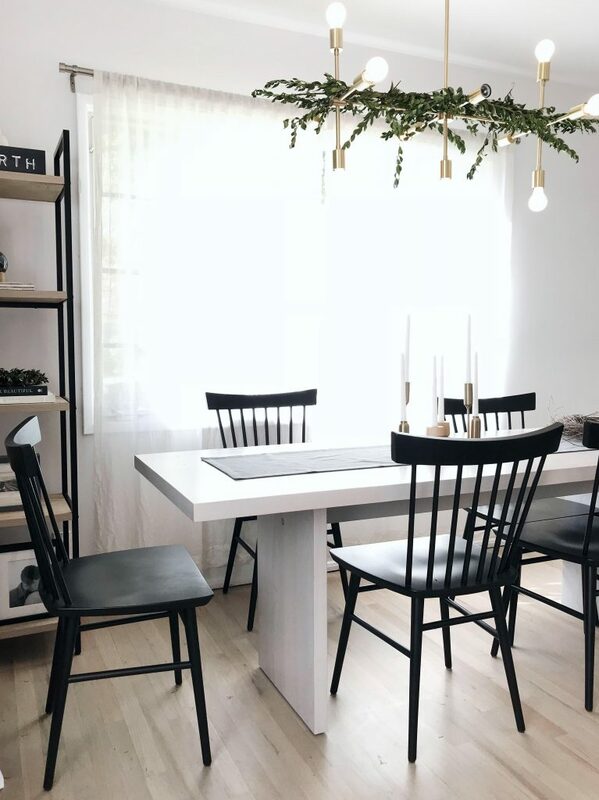 I recently partnered with Room & Board to furnish the dining room of my new home, and I’m so thrilled with how it turned out that I wanted to share the design process and some photos of the final room with you! Because I’m great at advising others on design but notoriously bad at making decisions for my own home, I enlisted the help of interior designer Martha Mulholland to narrow down the options for my space. The outcome in these images is the result of my initial vision combined with her expertise—and plenty of support from Room & Board, of course! Whenever I approach a new design project, I make a wishlist for how I’d like the space to function and feel. I take into account everything from the physical footprint of the room (how big it is, the shape of it, where the windows and doors are, what the traffic flow is like) to the emotions I’d like to experience when I’m standing in it (moody or bright? soothing or energizing? playful or serious?). I then filter all the decisions I make for furniture and decor through those parameters. In the case of our dining room, I started out with quite a long wishlist! I wanted to be able to entertain more than just a few people at a time, but I didn’t want a table that visually dominated our small room. Everything needed to fit my warm Scandinavian aesthetic, but also be versatile enough that I could change up the look with a little additional styling. The chairs had to be comfortable for long hours of sitting as I also use the dining table as my desk. The surface of the table had to be bright and subtly textured as I shoot flat-lay photos using the light from the large dining room windows. And oh yeah, it all had to be well-made and worthy of spending the next ten years in my house, at least! Phew, you got all that? Martha and I searched for several months on our hunt for a table and chairs that checked all the above boxes. Each time we thought we’d found a winner, a closer look would send us back to the drawing board. At last, it occurred to us to explore Room & Board’s selection of dining furniture, and with just one scroll through the catalog we knew we’d hit pay dirt! The broad range of styles and finishes ensured that we’d find exactly what had been eluding us, and I couldn’t be happier with the Corbett table and Thatcher dining chairs that we chose. Here’s why! The biggest challenge we faced in our search for a table was my dining room’s unusual size and shape. The room forms the long, narrow side of an “L” that is our open-concept living/dining area, and traffic passes through the dining room to get to the kitchen. A round or square table would block traffic to the kitchen, as would anything too wide; yet at the same time, all the standard-sized tables narrow enough were also too short and would have seemed to float, unmoored, in the room! That’s where Room & Boards custom sized tables came in. I was able to select the exact dimensions I needed—we went with a long, narrow 86” x 29” size—and the finished table provides the perfect focal point beneath the windows, without impacting flow to the kitchen! My personal aesthetic leans towards modern and simple, with organic touches for warmth; and the Corbett strikes my perfect balance between contemporary and earthy! Strong right angles give it a clean shape, while a weighty slab construction calls to mind broad-hewn planks from forests of yore. What’s more, the solid legs enabled me to choose chairs with any leg style, knowing that they wouldn’t look too busy against the table legs! Each of the seven wood finishes that Room & Board offers would make for a handsome dining table indeed! In the end, we gravitated towards ash with sand stain for a few reasons. 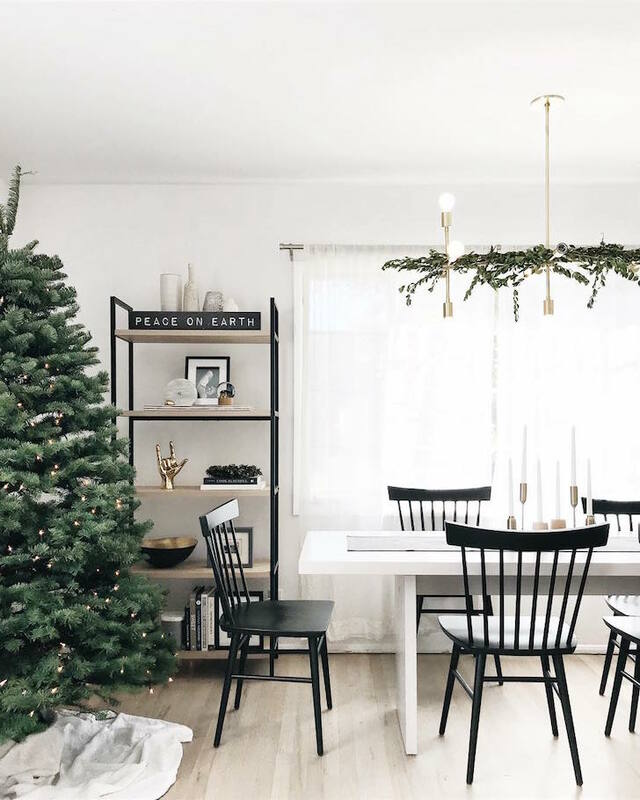 Firstly, its pale presence guarantees that although our long table takes up quite a bit of real estate, it doesn’t overwhelm the room too much. Instead, the table radiates light and makes the room seem bigger! Secondly, the lovely grain of the wood shows through, adding further depth to the layered natural textures incorporated throughout the room. 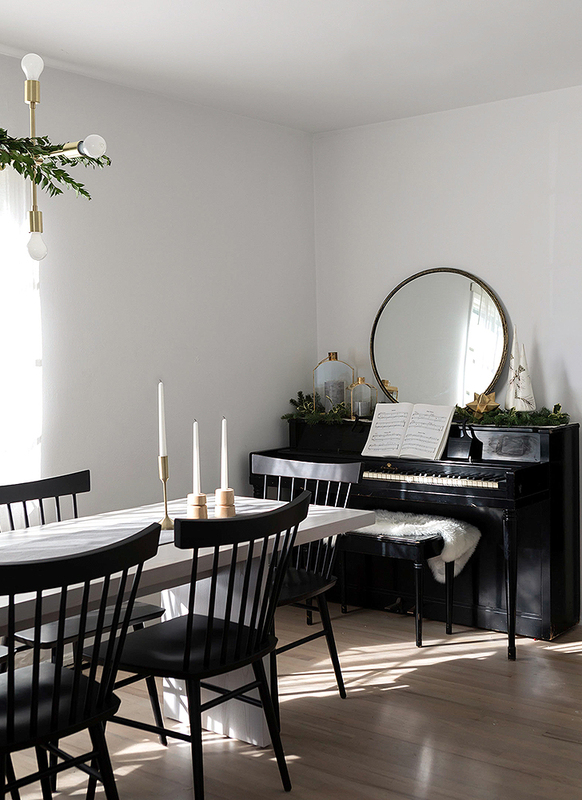 And finally, it looks beautiful set for both airy summer fetes and wintry Scandinavian gatherings. It’s truly the table for all seasons! Once we had the table selection on lock, shopping for chairs from Room & Board was like being a kid in a candy shop! I have always loved the influence of Shaker design—its unadorned elegance suits even the most modern spaces, while also bringing a sense of historical gravitas—and I fell hard for the Thatcher chair’s updated take on a classic theme. The slim, vertical spindles create an interesting graphic intersect with the table’s thick top, especially in the dark charcoal stain that we selected for the finish! The completed vignette is a calm yet considered study in contrast. Plus, the Thatcher is sturdy and comfortable enough for hours at the computer! Photos and words by Anne Sage of @CitySage. 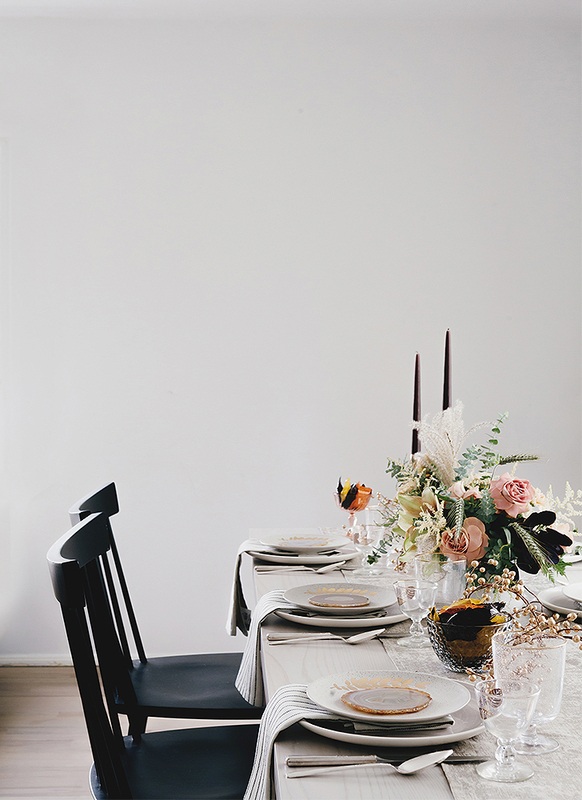 The Room & Board product featured in this post was gifted to Anne Sage for her dining space. All opinions are her own.